AMW x Kenzo Gives: Kenzo JEU d’Amour for Heart's Month! When I first sniffed Flower in the Air by Kenzo, I fell in love, deeply in love with the scent. Just when I'm almost done with my bottle, who would've thought a new scent from the same brand is coming this year? Just in time for the Heart's Season? "Love is a gamble. Seduction, a game of cards...never being where he expects you. All the better to charm him. 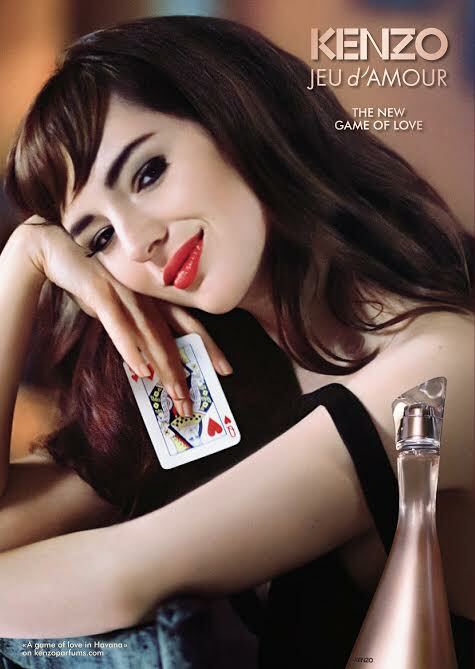 This Valentine Season, let the new game of love begin with Kenzo JEU d'Amour, the new fragrance for women." Can't imagine how this scent smells like just by reading my post? WELL, aren't you one "possible" lucky reader today! You may win a bottle of the new Kenzo JEU d'Amour fragrance! How? Contest starts today ends February 28, 2015. Winner must email me within 48 hours their full name, mailing address and mobile number or a new winner will be picked. Get more chances to win by joining my AMWxKenzo Instagram contest! "How do you and your partner keep the romance alive in your relationship?" We keep the romance alive by making sure that we dedicate time to each other despite our busy schedules. Love is sustained by effort, after all. We've been together for quite some time now, but we still make sure we say "I love you" to each other and write sweet little notes. Me and my partner always make sure we have time for each other and always talk about what happen to us everyday. We keep the romance alive by building on friendship and not letting responsibilities overshadow the romance. We also make time for fun time together, revisiting places that are special to us or simply doing the things we both love. If I win, this will be my first perfume, ever! First God is always the center of our relationship. Communication is consistent, space too. Trust and fidelity.. Despite our busy schedules, we never lose time for each other. We never forget important dates and ocassions in our marriage. My husband and I make it a point to still go on dates. Have regular and open conversations, plan out our future together. As a married couple, we never miss hearing mass together and praying together. Giving little surprises and compliments to each other also helps us in keeping our love for each other grow stronger. We decide to choose to love each other everyday. How we rekindle romance in our relationship? It's through constant communication and being open to say ï love you" and ï miss you". i always make sure i am vocal in what i feel. Action speaks louder that words isn't enough most of the time. A surprise gift and travelling together is also a plus. We both love food; going out on restaurant dates once in a while keep our relationship interesting. It's beautiful, it really is not the same woman dressed now out of work, and I intend to buy swarovski charm to dress themselves, enhance their charm. Wow, I love Kenzo.. To answer, since my hubby is a TFW, we keep our relationship going by communicating through facetime and viber every single moment of everyday. We always see to it that I have time for him, and our baby loves to see him everyday. We talk about random stuffs and everything. That keeps our relationship strong, since he has been away from us for 3years in a row. Thank you for this opportunity Ms. Nikki. We keep the romance alive by making sure that we still go out as a couple every month or simply having couple time every single day, be it watching tv or movies together, chitchatting, etc. We keep the romance alive by trusting each other and respect each other. We enjoyed running together as part of our healthy relationship hihihi :) ofcourse we want to be healthy for our lil Patotie. To keep the romance alive.. me & my hubby by showing our love to each other, respecting each decisions and communication.. even though we are both busy. We keep the romance alive by making every moment precious when we are together,sharing each other dream,being passionate! We keep the romance by keeping in touch everyday thru skype even though he's miles away from me,. as of now im not in relationship but before we keep romance as we cherish every moment we had. we keep romance by taking good care each other & saying iloveyou. My hubby is my first love and he will always be my greatest love. 10 years as husband and wife and we still feel the same we felt when we shared our first kiss. Marriage shouldnt be an excise to stop making your love on fall in love with you. I make it a point to show him how much he means to me everyday, flirting with him makes him blush and that look in his eyes makes me realize that i am still the center of his world and he does the same with me with simple surprises that still make my heart skip a beat with happiness. Appreciate each other, to always keep in mind and act accordingly to our favorite saying "family first" We are in this for the long haul and i will make him fall in love with me every single day of our lives. In our 33 years of marriage we always respect and love each other, We always feel young and young at heart! We make it a point to do silly things together, since a shared sense of humor helped develop our relationship in the first place. It's anything from "kwentuhan" to watching comedies to hanging out with equally silly friends, and we end up having a blast. Been married for 8 years, we fight,had misunderstandings,tampuhan at selosan but we never let the day pass without mending.Pag nagkalabasan na ng sama ng loob,mag sosorry na and exchanged i love you's.So,ok na ulit kami then magsi sine na kami together. We make it a point that we have an hour or two to spend together after a busy and hectic schedule we have for work and with the kids. maybe a coffee date or a walk inside the base it's all worth it. It is not as lavishly romantic but I can make her smile and that is the important thing. I'm single right now but if I have a partner, I believe the best thing to do to keep the romance alive is constantly communicating (texting, calling and talking by any means) and getting to know each other like in the courtship stage. Been married for 41 years now... we just celebrated it last Feb11. My marriage with my husband was not as romantic as the fairy tale in the book, but I always feel bless with the years I have with him. Though there were parts in our marriage that we were separated because of his work.. I managed to stay and be busy with raising our kids. Now that we are both enjoying our senior years.. having meals with him is the romantic part of our everyday life. I think you need both Respect to each other and have always communicate to each other.